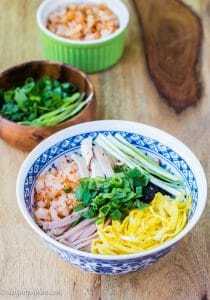 Vietnamese Bun thang (Hanoi rice vermicelli noodles with chicken, eggs and pork) is a sophisticated Northern Vietnamese noodle soup with many layers of flavors and delicious toppings. 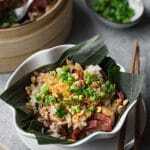 It is a must-try dish for anyone who wants to explore the true taste of Hanoi cuisine. When people think of Vietnamese noodles, pho and bun bo Hue (Vietnamese Spicy beef and pork noodles) are those that usually come to mind first. However, in Vietnam, we have many other delicious noodle dishes, one of which is bun thang (another one is Fried fish noodle soup). 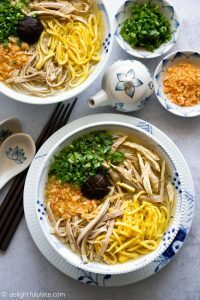 Bun thang (Hanoi vermicelli noodle soup with chicken, egg, and pork) and Cha Ca La Vong (Turmeric Fish Noodles) are two traditional dishes that represent the elegance of Hanoi cuisine. It is delicious with beautiful presentation. However, I have never seen it in any Vietnamese restaurants in either the U.K. or the U.S. The good news is cooking it at home is pretty easy. Bun thang consists of rice vermicelli noodles, a broth made from chicken, dried shrimps and dried shiitake mushrooms, and a number of toppings including shredded chicken, thin pork sausage (gio lua) strips, thin strips of egg crepes, shrimp floss and aromatic herbs. 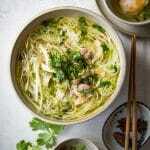 Vietnamese people created this noodle soup to eat after Tet holiday (Lunar New Year) to use up all the leftover foods. We are not sure where the name of this colorful noodle soup came from. Some said the word “thang” implies Chinese medicine which contains a variety of dried herbs, just like how this dish has a lot of ingredients. Others said “thang” simply means “soup” so its name means a noodle dish with soup. The only thing I’m sure about is it tastes sophisticated and delicious. The clear and flavorful broth is the soul of this dish. It is made by simmering chicken, dried shrimp, and dried shiitake mushrooms. 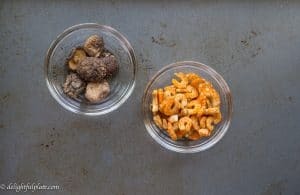 You can find both dried shrimps and dried mushrooms at Asian grocery stores. Dried shrimps are frequently used in Vietnam to add flavors to stock/broth. Those three ingredients create a broth with so many layers of flavors: light, savory and sweet. I can’t find a word to describe; it’s just sophisticated and comforting. Bun thang contains toppings with different flavors and texture, which makes the dish interesting and fun to eat. I think all the toppings are equally important, but if I had to pick, the shrimp floss would be the most important one. I poached the shrimps just until they were cooked through and chopped them roughly in my food chopper. Then I toasted the shrimp pieces in a non-stick pan so that they lost moisture, and firmed up. Their flavor concentrated and intensified. Making the shrimp floss made my kitchen smell amazing. Other toppings include thin egg strips, shredded chicken and thin pork sausage strips. You can find Vietnamese pork sausage at Vietnamese grocery stores or some Asian grocery stores. Look for cylindrical shaped sausages labeled as “gio lua”, which are usually refrigerated or sometimes frozen. When serving this dish, people in Hanoi also like to add a small amount of shrimp paste (“mam tom”) to their noodle bowls. This condiment is very pungent but it does enhance the flavors of the noodle soup. My favorite it the fine shrimp paste from Lee Kum See brand. You can find it at any Asian grocery stores. When I was a kid, my family often went to Tong Duy Tan street (a walking street in Hanoi) to eat bun thang for breakfast. It was a very long time ago and I don’t know if they still sell it there or not. When I studied in London five years ago, my housemate and I learned to cook this dish and made it almost every weekend. Yes, it is that delicious. 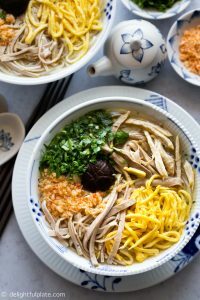 This colorful and unique noodle soup really deserves more attention. I hope to see it becoming well-known abroad, just like Vietnamese pho noodle soup and bun bo Hue. Note: the post was updated with a better quality photo in February, 2019. Below is the old photo which doesn’t do the dish justice :). Bring a pot of water to a boil. Add 1/2 teaspoon of salt, vinegar and chicken to the pot. Let the chicken sit in there for 1-2 minutes. This step helps eliminating the poultry smell and reducing the amount of foam in step 5. Cover dried shiitake mushrooms and dried shrimps in hot water to rehydrate them. After 2 - 3 minutes, discard the water. 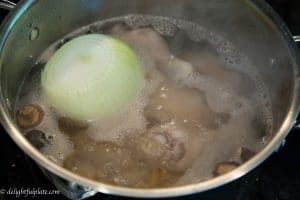 Remove the chicken from the blanching liquid. Discard the liquid and wash the pot. Add chicken back to the pot, and also add dried shiitake mushrooms, dried shrimps, onion, ginger, and 1/2 teaspoon of salt. Pour about 8 cups of water (2 liters of water) into the pot. Turn on the burner and bring it to a boil. Skim off any foam. Reduce the heat to low, cover the pot and let it simmer. When the chicken is fully cooked, transfer it to an ice bath. The amount of time to cook the chicken depends on its size. I used a cut-up chicken so it only took about 15 minutes. Add 2 tablespoons of fish sauce. Taste the broth and adjust with salt or fish sauce as needed. Continue to let it simmer very gently. Once the chicken is fully cooked, transfer it to an ice bath to stop it from further cooking. When it has cooled down, remove it from the ice bath and shred the meat. Put the chicken bones back to the simmering broth. Peel and poach the shrimps until just cooked through. 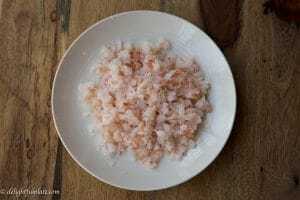 Put the cooked shrimps in the food chopper and chop roughly into small pieces (see image below). You can certainly chop them into smaller pieces than mine, but remember they will shrink when we toast them. Heat a non-stick pan over medium high heat, add a little oil and shrimp pieces. 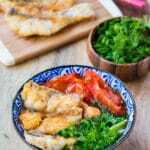 Toast, stir frequently until all water content evaporates (about 5 minutes), add 1/4 teaspoon of fish sauce, stir well and transfer to a bowl. Slice the Vietnamese pork sausage into thin slices and then cut into thin strips. Crack the eggs into a bowl and season with a pinch of salt and black pepper. Beat well. Heat a non-stick pan over medium heat, lightly grease with oil and pour just enough egg mixture to create a thin layer. Cook until the egg mixture is set, flip once. I can make 2 egg crepes from 3 eggs. Remove from the pan to a cutting board. 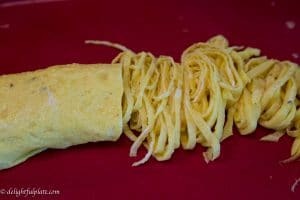 After all the egg crepes are made, roll them and slice thinly. Prepare dried rice vermicelli noodles according to instructions on the package. 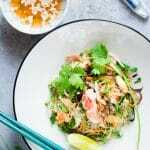 Fill a bowl with rice vermicelli noodles, then add all the toppings and chopped herbs. Arrange the toppings as in the image below. Taste the broth again and adjust seasoning if needed. Ladle the hot soup over the noodles. Serve immediately. If you can eat fermented shrimp paste (this paste is flavorful but very strong and pungent), you can add a very small amount of it to your noodle bowl, mix with the broth before eating.